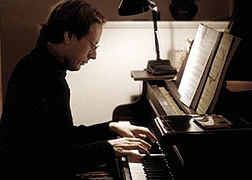 If book readers may seem, for a while, to live in the skin of the author, then the listeners of Ambient Music should be thought to meet the mind of the composer with each play of their work. 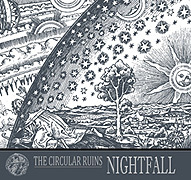 Such may be thought of Anthony Paul Kerby, and his project The Circular Ruins. The sensitive soundscapes of his vividly imagined Nightfall (64'46") effectively translates his mental impulses into six richly textured indulgences into introspection. We will surely be able to identify each track's beginning, and ponder when we have reached its middle, but we will notice each piece's conclusion only once we are transported back into our silent listening space. Good Ambient Music will deliver us back to our chairs. The experience of Nightfall may deliver us back to ourselves, and a greater state of focus. This album's subtle variations of timbre, consonance and dissonance, as well as a feeling of depth, portray Kerby's subtle suggestions and a delicate sonic idiosyncrasy. Its seamless fusion of bold synthesized shapes, confined field recordings and saturated tones will have us wondering what is beneath the audible surface? Slow simple melodies of electronic flute notes state a shade of melancholy, as sustained organ chords hold the terrain below. The magical movement between dispossessed harmonies and pastoral atmospheres is heard as a simple, logical metamorphosis from dark to light. Venturing into regions of Avant-Garde, by way of New Age, Spacemusic and the Neo-Classical, Kerby realizes a detailed, accomplished soundspace across each track. With the mood so changeable from moment to moment we are unable to anticipate what will happen next - which is certain to dishearten those with more prevailing expectations. So we keep in mind that Kerby views music as much more than decoration. From a questing mind, his dynamic abstractions coalesce into something defined by the audience. This work challenges conventional forms, and might be too sacred to share with non-ambientalists - which is probably OK with this composer. It may be that he needs his listeners more so than a typical musician does - as he uses our commonwealth of quiet minds to help make sense of himself.